It always amazes me that as soon as the snow starts to melt, runners hit the road. Despite the fact it is 32 degrees with a brisk head wind, I see runners in shirts, no jacket and shorts, dodging remnant snow piles, pot holes and all forms of traffic to get their runs in. You runners are a very motivated bunch and apparently impervious to cold. If you are one of these diehards, you are probably no stranger to tendonitis, plantar fascitis, shin splints and sore calf muscles. A basic yoga program can help prevent injury, and should that fail, promote recovery from a variety of running related maladies so read on…. In this series, The Fast & the Flexible, I am going to address the specific needs of runners, one section of the body at a time. I will suggest a few poses which will help any runner improve their performance, prevent injury and promote recovery, and hopefully take their running to the next level. First up, feet, ankles and calves. The feet are probably the most under-rated appendage we have. Here are some fun facts: the feet contain 25% percent of all the bones in our body; each foot has 26 bones, 33 muscles, 31 joints and over 100 ligaments; and, finally, the feet have over 250,000 sweat glands (Gads! that explains a lot). These are very complex pieces of machinery, and need a little attention to keep them running smoothly (pun intended). 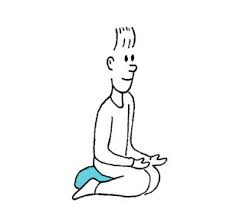 In my previous post, What Every Soccer Coach Should Know about Yoga, http://nextlevelyoga.net/2014/03/20/what-every-soccer-coach-should-know-about-yoga/ I detail Hero’s Pose with toes tucked and un-tucked. This is a runner’s first line of defense against shin splints and plantar fascitis. Any serious runner should practice this pose several times a week, it is easy to do while watching TV, reading or if you are like my husband, while playing Call of Duty. Virtually anyone who runs knows the pain of a shin splint, it is an inflammation of the muscles, tendons, and bone tissue around your tibia. Shin splints can put you out of training for weeks until they heal, and if you simply go back to your program without adding some flexibility conditioning, the likelihood of re-injury is very high. Plantar Fascitis is inflammation of the tissue in the sole of the foot that causes pain when you put weight or pressure on the foot. Both fascitis and shin splints are generally caused by repetitive motion activities. The Hero’s pose series will help gain flexibility and increased blood flow to the ankles and feet which can help you avoid these issues. The Achilles tendon is the largest tendon in the body. It connects your calf muscles to your heel bone and is used when you walk, run, and jump. Although the Achilles tendon can withstand great stresses from running, it is also prone to tendonitis, a condition associated with overuse and degeneration. Upright Frog, (which also goes by the name garland pose, or the less dignified, “squat”) is a great pose to condition the Achilles tendon, while stretching the calf and opening the feet, it is the trifecta for the lower leg. 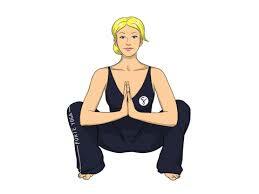 Upright Frog, Garland Pose or Squat. Stand at the top of your mat with your toes angled out so that the balls of your feet on the floor while your heels remain on the mat. With me so far? Bend your knees slightly and bring the palms of your hands together. Place your elbows on the insides of the knees and flatten out your back. This may be where you stop, but for those intrepid “soles” (ahh puns, the comic currency of the immature, I love them) ready to venture on, you will start to allow your hips to sink down. The key here is to keep your heels firmly on the mat, if they start to lift, back out a bit, take a few breaths and test it again. It may take several tries before you obtain the flexibility in your ankles to get all the way down. Under no circumstances should you force your way into this pose, you will hurt yourself and frankly that is simply counter-productive. And here you are, in the elegant and ever so dignified Upright Frog pose. Try to stay here for 30-45 seconds, taking deep breaths to ease the discomfort. The “calf muscle” is made up of three separate muscles which unite to form the Achilles tendon. The calf seems to be the one area most runners know to stretch, unfortunately they do it half-heartedly. We have all seen that guy pressing against a wall or tree with one foot back, he stands there for about 10 seconds and BAM he’s off. Good luck fella, I won’t be surprised when I run pass you later as you are standing next to the trail grabbing your lower leg. Calves need a good long, gentle stretch. Never leverage your heel down while standing on a step, the force on your Achilles is too much and you will probably strain something. Instead, give Cross Leg Forward Fold a try. Stand with your feet hip distance apart, then cross over one foot, lining up the knees. Hinge forward at the hips and bring your hands to your front knee and flatten your back. Stay here for a few breaths and then, on your exhales, start working your hands down the shin and maybe to the floor or to a block. When you get to your furthest extension, pause and check in with your hips. We tend to let the hips fall back in the pose, so make sure your keeping the hips up over the ankles to avoid putting too much pressure on the back of the knee. Hang out here and breathe for 60-90 seconds. If you can commit to 10 minutes a couple of times a week to do the Hero’s set, Upright Frog and Cross Leg Forward fold, I can almost guarantee you will decrease or completely eliminate lower leg injuries from your running experience. Now what I can’t do is teach you to wear a coat when you decide you must run in 30 degree weather, that one is on you. ← What Every Soccer Coach Should Know About Yoga. This is very useful for runners. Practical and easy yoga moves tailored for lower parts of the legs. I will add them to my weekly routine and look forward to the future series.